Well, now I have witnessed stall cleaning the German way. 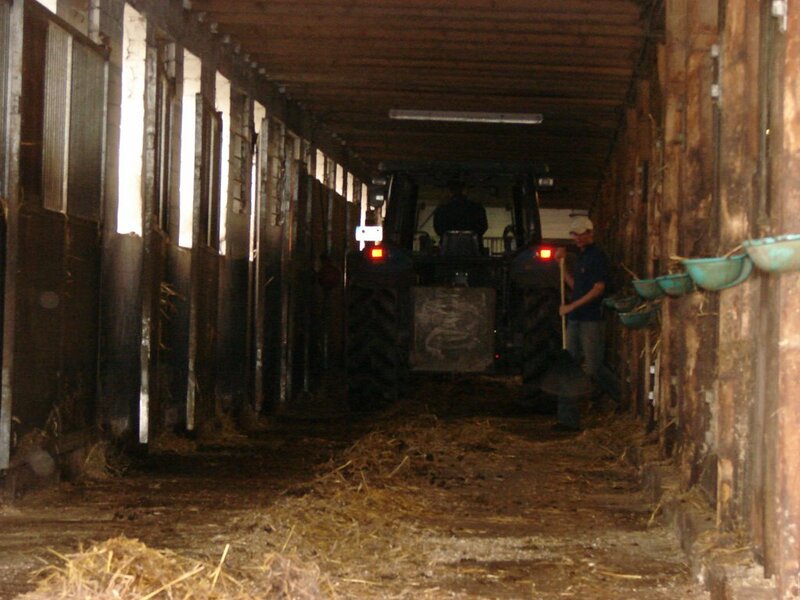 As I mentioned earlier, the stalls are not cleaned on a daily basis when the horses are bedded on straw. Instead, they use the deep litter method, just adding more each day. After about 6 weeks, when all the horses look 18 hands in their stalls because there is so much bedding, it is time to strip the stalls. The horses are moved out of their stalls (turned out, put in another barn or just tied somewhere for a few hours) and the work begins. All the feed bins have to be unscrewed from the wall, and a bottom board that is on each stall divider is removed, then the walls can swing back flush against one side so the tractor can come in and start scraping out the straw. It still takes a couple of people with pitchforks to take the bedding away from the walls so the tractor can take it out. What a tremendous undertaking. All the bereiters and working students do this and it takes until about lunch time to get it put back together, then they still have to ride all their horses in the afternoon and into the evening. Needless to say, they dread having to do the stalls. The other photo is of a truly international dinner party. 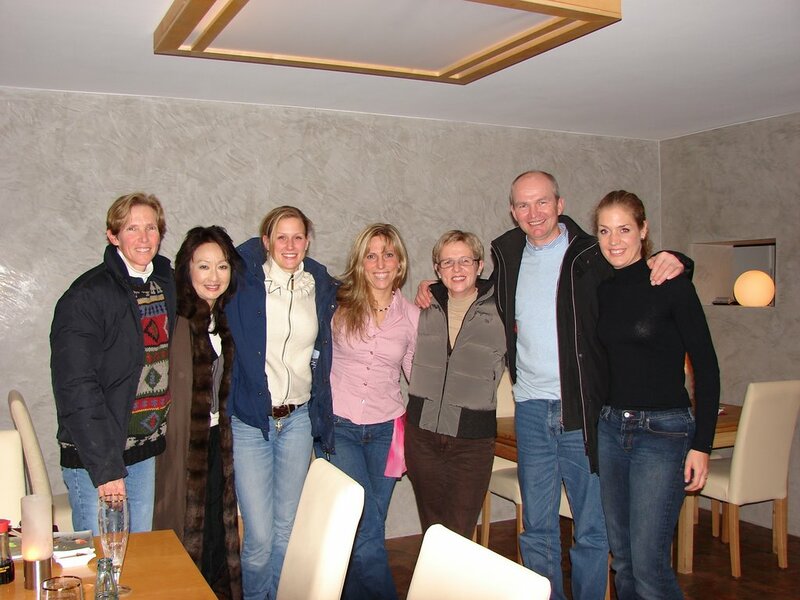 The US, Japan, Sweden, Germany and Holland were all represented the other evening at a restaurant in Paderborn. It was a real treat to listen to Hubertus talk about his experiences riding at Olympics and World Championships. We also had a lively discussion about the different methods of training horses by some of the top riders in the world. The nice thing about the system that Hubertus uses is that it can be used on any type of horse, energetic or lazy, super athletic or just an average mover and by riders of all levels, amateur or professional with good results. The basis of his system follows the classical training scale with the emphasis on the idea that the horse must be very loose, supple and easy on the contact, thereby allowing them to move with the most swing and cadence in all the movements. For those of you having trouble with your flying changes, remember that the horse has to be straight before the change and soft on the new inside rein. If that is the case, you can give the horse a very soft leg aid while you support him on the new outside rein. If he doesn't change correctly, it isn't really a question of needing to use a stronger leg aid, rather, he probably wasn't loose on the new inside rein. Take time to make him loose on the new inside rein before the next attempt and keep the leg aid soft. He is also very big on riding with the horse positioned or flexed at the jaw to the inside while keeping the horse's body absolutely straight. We ride a lot of shoulder fore, especially in the canter. The horses MUST go into and bend in EVERY corner. If you can do that, the half passes are so much easier. If the horse is loose on the inside rein, he can continue to swing at the trot during the lateral work also. Above all, the haunches must never lead in half pass, otherwise he loses his balance and is unable to keep swinging. It sounds very simple because in theory it is ,but it takes a lot of practice to do it reliably, day after day. I am quite sure Hubertus has never gotten the comment from the judge that there isn't enough bending in the half pass. All of the horses in his stable do exceptional half passes, again proving that his system can be used on all horses. The same goes for pirouettes in canter. If you can keep the horse's body straight on the line (diagonal) while you collect him and bend him, you can relax during the pirouette because the hard work is done before you ever start turning. The same with the piaffe. If the horse is loose in the hand and obedient to the leg before you ask, you can relax during the piaffe and it is much less stressful for the horse and he can stay even and swinging (in his back) during the piaffe and passage. Preparation before each movement is key and maintaining a high standard of how light the horse is on the reins between the movements determines your degree of success.